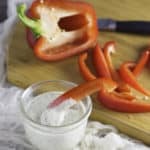 This allergy-free Homemade Vegan Ranch Dressing Recipe is great for salads, veggies, or as a spread on sandwiches or wraps. It's vegan and nut-free to boot. Blend together the hemp seeds, water, garlic powder, onion powder, dried mustard, salt, vinegar, and date if using until smooth. It took my puny little blender about 3 minutes, and I needed to scrape the sides several times. Once everything is blend in about 1 tablespoon of the oil. Stir it in with a spoon, and then turn the blender back on and drizzle in the rest. Add the parsley and dill and pulse a few times to combine. I like to make the herbs kind of small so that the uneven white of the hemp will be less apparent. Use the vegan ranch dressing as is for dips, or you can thin out with a touch of filtered water to desired consistency for a salad dressing.